Hope everyone has some fun weekend plans! If those plans involve lounging by a pool or frolicking on a beach, I jealous. If you're plans don't involve reapplying sunscreen every 30-40 minutes but you still want to look like you spent the weekend in your bathing suit fear not. I have some fantastic sun-less tanning solutions for you! Perfect Prep Body Slimmer By Mally Beauty ($35, QVC.com)-Many people don't like using a sunless tanning lotion because of all the preparation time needed or they prefer something instant and temporary. Celebrity makeup, artist Mally Roncal (who has worked with Beyonce) created a bronzing solution that makes you look slimmer from every angle. 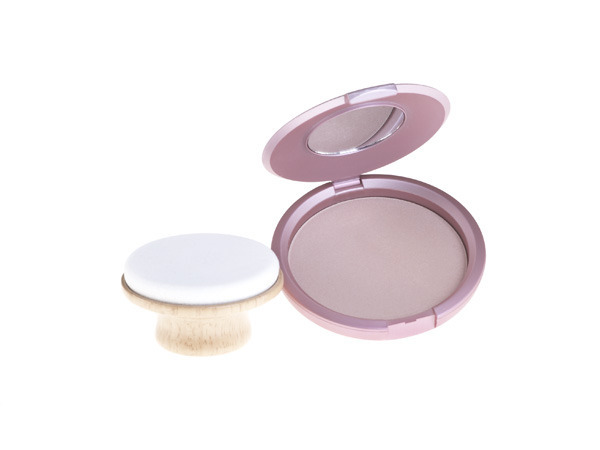 The pressed-powder formula combines moisturizers, beeswax and lanoline with just the right amount of shimmer to give your skin a gorgeous, vibrant glow. The compact comes with a uniquely designed "The Bone Finder" applicator which features a flat shape that makes it easy to follow the contour of the bones and muscles for a sculpted application. Most people love how slim their tan body looks and this mimics that exact effect without having to roast in the sun. The Slimmer is available in a light shade for fair skin tones and dark shade for tan complexions. I used the dark shade and thought it was a great body bronzer. Lierac-Autobronzant Hydration Corps ($30, CVS.com or lierac-usa.com)-Lierac's Self Tanning Lotion gives you a streak-free tan without the typical tanning smell. The active ingredients in the lotion include cinnamon (known for its tonic and antiseptic properties and commonly used for its soothing effect) and pure vanilla (concentrated forms of vanilla have deep-tanning qualities which result in more intense and rapid tanning). The self-tanner evens and prolongs a natural tan, while also providing anti-aging benefits. Clarins Delicious Self Tanning Cream ($42, Sephora.com)- This silky, lightly scented self tanner for the body was a CEW Beauty Awards Winner. The caramel-colored lotion glides on smoothly and provides a mistake-proof application. 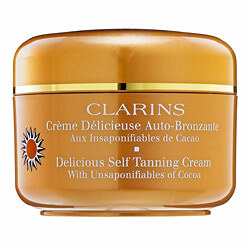 The golden-glow formula has Pure Cocoa which makes it smell delicious and feel amazing on the skin. St. Tropez Self Tan Bronzing Mousse ($30, Sttropeztan.com/)-Use this top of the line self-tanning solution on your body and face. The tanning products use Aromaguard™ fragrance technology which eliminated the typical self tan aroma by at least 70% and the mousse makes application quick and simple. The tanner dries in an instant and the color is long-lasting. Remember to exfoliate your body beforehand to optimize the effects of the tanner. Guerlain Terracotta Spray SPF 10 ($59, Sephora.com)- If you use airbrush spray foundations (like I do) you already know how much you love this type of format for the face. 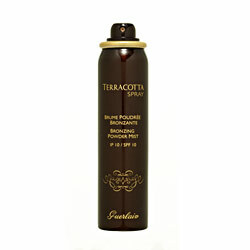 Terracotta Spray uses the technology of a professional airbrush makeup application and goes on in an ultra-light mist. The spray diffuses evenly onto the skin and ensures a uniform application that covers ever inch of the face. It's a fantastic bronzer and has SPF 10. Guerlain has long been the leader in producing high quality bronzers and sun-centric products and this is no different. L'Oréal Paris Sublime Bronze Properfect Airbrush Self-Tanning Mist ($9.99, drugstore.com)-As mentioned, I'm a big fan of airbrush products. They spray on effectively and truly give the most even, flawless finish. This self tanning mist for the body flash-dries so there's no need to rub it in. You can easily spray your hard to reach places like you back or the back of your legs with this bottle and your natural-looking tan will begin to develop in less than an hour. Enjoy the last few weeks of summer people! You're definitely going to want to keep these sunless tanners around after Labor Day to ensure you're golden sun-induced glow doesn't fade away along with the warm weather!